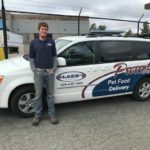 Olsen’s Grain Prescott location offers pet food delivery. Free pet food delivery is now being offered for anyone within 10 miles of our Prescott location for any order of $25.00 or more. Simply order $25.00 worth of pet, wild bird and or horse food, (bags only) and get free delivery. Sorry, no hay deliveries. If your order is under $25.00 we will still deliver for a minimal fee of $5.00. Delivery is available Wednesday, Thursday and Friday’s. Do you find yourself working late and unable to get by our store before closing? No problem, give us a call and we will deliver to your office. Homebound and limited mobility customers are utilizing this service and our friendly staff will even fill your pet food containers or bins. Olsen’s carries a large variety of dry and canned dog and cat foods as well as small animal foods such as guinea pig, hamster and rabbit food. We stock wild bird food blends and caged bird foods. We also carry many choices of treats for your pets. Many of the pet foods we carry have a loyalty program. The loyalty program allows you to purchase so many bags of specific brands and earn a reward. Prescott Location is located at 711 Elrod Road. For more details call 928-445-1664. This entry was posted on Wednesday, March 27th, 2019 at 1:04 am	and is filed under Bird, Cat, Dog, News & Updates. You can follow any responses to this entry through the RSS 2.0 feed. Both comments and pings are currently closed.